For headache, fever, aches & pains, blocked nose, sore throat and chesty cough. Non-drowsy. Paracetamol Phenylephrine Guaifenesin Each 20 ml dose contains: Ingredients: Paracetamol 500 mg, Action: Painkiller and fever reducer, Relief of: Headache, sore throat, shivers, fever, aches & pains Ingredients: Guaifenesin 200 mg, Action: Expectorant, Relief of: Chesty, productive coughs Ingredients: Phenylephrine Hydrochloride 10 mg, Action: Decongestant, Relief of: Blocked nose, painful sinuses What is it for? 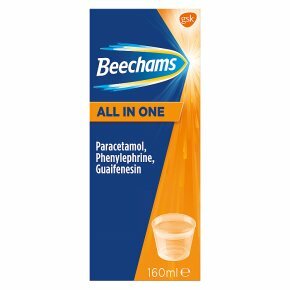 Beechams All in One oral solution provides relief from the symptoms of colds and flu, including chesty coughs. Please read the enclosed leaflet carefully before taking this medicine. How to take: For oral use. Adults and children aged 16 years and over: Fill measure cup to 20 ml mark and take one 20 ml dose. Repeat every 4 hours as necessary, but do not take more than 4 doses in any 24 hours. Do not give to children under 16 years of age except on medical advice. Do not take for more than 5 days except on medical advice. KEEP OUT OF THE SIGHT AND REACH OF CHILDREN.<br><br>DO NOT TAKE MORE MEDICINE THAN THE LABEL TELLS YOU TO. IF YOU DO NOT GET BETTER, TALK TO YOUR DOCTOR.<br><br>DO NOT TAKE with any other flu, cold, decongestant products or cough suppressants and do not drink alcohol.<br><br>Contains paracetamol. Do not take anything else containing paracetamol while taking this medicine. Talk to a doctor at once if you take too much of this medicine, even if you feel well.<br><br>CONSULT YOUR DOCTOR<br>Before taking this medicine, if you are under the care of your doctor or receiving prescribed medicines or are pregnant, or suffer from chronic cough or asthma.